Dark? White? Baking? Here’s which is least likely to turn you into a sugar-crazed chocoholic. Here’s a fact that might make you wonder why Willy Wonka isn’t president: Americans consume 2.8 billion pounds of chocolate each year, or approximately 12 pounds per person (about 1,200 Hershey Kisses). Most people would agree that eating this much chocolate is terrible for us: Commercial chocolates (like those produced by, say, Hershey) are chock-full of sugar, fat and calories in order to make them taste sweet. Meanwhile, chocolates made strictly from cacao (which are a much healthier choice, for reasons we’ll touch on shortly) taste bold and bitter. But over the past few decades, massive chocolate manufacturers have been hard at work pushing the notion that their chocolate (particularly their dark chocolate) is actually a health food. Using that explanation as our guide, we’ve ranked every common type of chocolate by how healthy they are with the help of Hunnes. 1. Unsweetened Baking Chocolate: “This is basically lightly-processed cacao,” Hunnes explains, which means it contains most of the flavonoids, antioxidants and phytonutrients that we mentioned earlier. But once again, since unsweetened baking chocolate doesn’t contain added sugar (which would presumably be added during the baking process), it’s extremely bitter and extremely unpleasant to bite into. 2. Bittersweet Chocolate: Similar to baking chocolate, bittersweet chocolate is almost always used in baked goods, since it sports high amounts of cacao (and therefore, is quite bitter when consumed by itself). “This has a small amount of sugar,” Hunnes says. “But it’s otherwise similar to unsweetened baking chocolate.” Bittersweet and semisweet chocolate (which is up next) can be used in baking interchangeably, depending on your taste for sugar. 3. Semi-Sweet Chocolate: This is essentially a sweeter, more sugar-filled version of bittersweet chocolate, and again, it’s primarily used for baking. “Semi-sweet chocolate has a little more sugar than bittersweet chocolate, and it sometimes contains milk solids,” Hunnes explains. Milk solids refer to the dry powder left over when water is removed from liquid milk, and they contain the possible tumor-promoter casein (animal protein). 4. Dark Chocolate: Hunnes points out that different brands of dark chocolate can contain different amounts of cacao, which as we’ve mentioned, is the real decider of how healthy any type of chocolate is. Generally speaking, though, dark chocolate contains more cocoa than the following types of chocolate. 5. Couverture Chocolate: Couverture chocolate is usually tempered, which is a process that makes it smooth and glossy. As such, this type of chocolate is often used as a coating for candy bars, since it looks nice and provides a “snap” when you bite into it. “Couverture chocolate contains extra fat from cacao butter,” Hunnes says. “But cacao butter has a better fatty-acid profile than milk.” More specifically, cocoa butter consists of palmitic acid (which increases your risk of cardiovascular disease), stearic acid (which appears to have a neutral effect) and oleic acid (which decreases your risk of heart disease). The effects essentially negate each other, meaning consuming these fatty acids together in a piece of couverture chocolate will have little effect on your heart. 6. 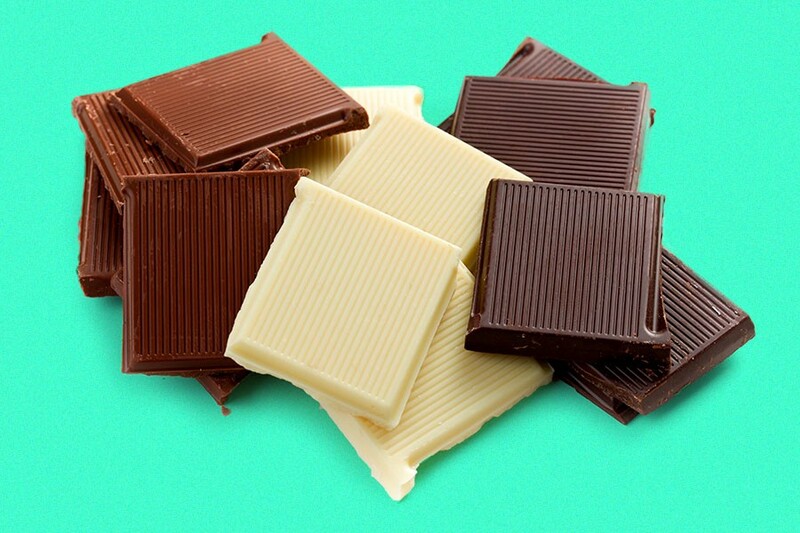 Milk Chocolate: “Milk chocolate has less cacao than the chocolates we’ve already mentioned, as well as much more sugar and milk solids,” Hunnes says. Now, there’s also something called carob, to which Hunnes says, “Carob isn’t chocolate and doesn��t taste as good.” She’s right: Carob comes from the pods of carob trees, whereas cacao comes from (you guessed it) cacao trees. While they certainly look similar, carob is actually a healthier alternative that contains fiber, antioxidants as well as low amounts of fat and sugar. So if you’re in search for a healthier option, there’s always that. But when it comes to actual chocolate, the darker and more bitter, the better it is for you, which is a sad (but all too expected) outcome.